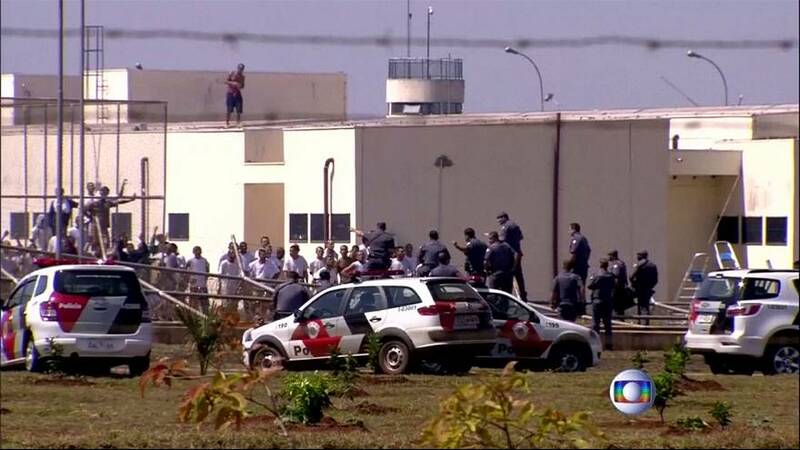 At least 200 prisoners are still at large following a jail break from a minimum-security prison in Brazil. At least 500 escaped after violence broke out on Thursday. State prison officials say around half were recaptured within hours of the break but the others remain at large. The inmates fled from the Jardinopolis open prison, around 160 kilometres northwest of Sao Paulo, Brazil’s second city. Officials say the inmates had set fire to several cells in one wing of the prison during a routine morning call. Scores of prisoners knocked down a four-metre high mesh security fence in the chaos that ensued. They fled into nearby fields. There was no immediate word on possible deaths or injuries among guards or inmates. How many people were inside the prison? The prison housed over 1,800 inmates, according to the Folha de S.Paulo newspaper. It was only built to house 1,000. State authorities declined to comment on reported overcrowding at the facility. They did not respond to a request for information about the type of crimes committed by prisoners housed there. Is this kind of problem common in Brazil? Prison uprisings and escapes are frequent in the country, which has long been criticised by human rights organisations for its prison conditions.